Over the years, building ‘Hackintosh’ computers has become both a lot easier and more popular. For those unfamiliar, a Hackintosh is essentially a machine running OS X on non-Apple approved and manufactured hardware. There are many reasons to build a Hackintosh instead of buying a Mac directly from Apple. They can be more expandable, faster, have more features and configurations, run quieter and can be a great learning experience. One of the biggest reasons to go down the road of building your own, however, is price. It’s no secret that Apple charges a premium for its products, especially if you don’t need some of the hardware (Thunderbolt for example). 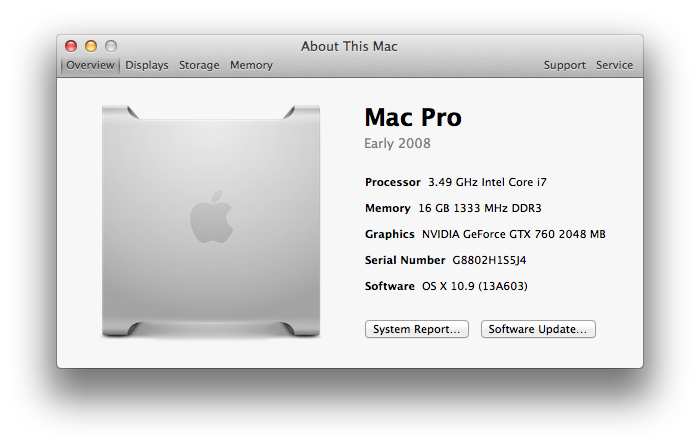 And thanks to the ongoing growth of the Hackintosh community, the process has become very easy over the past few years. Back in 2011, Seth took a stab at building a Hackintosh. He originally intended on it being an affordable, baseline model without many bells and whistles. He ended up building a $750 ‘beast’ that competed with the best iMacs of the day, though. Now, it’s my turn to make an attempt at building a Hackintosh, but with an added twist. I am building one capable of performing on par with the highest-end Macs and capable of powering a 4k monitor. And, I want it took look ultra-sleek on the outside and be absolutely silent. I don’t want to be able to hear the hard drive, fans, or anything else –essentially nonexistent in my office. Most of all, I want to do it on a budget of about $1500, not including a 4k display. Let me preface this with something, though: I have never built a computer, Windows or OS X. In fact, up until this project, I was pretty clueless as to what went into building a computer. So if I am able to successfully build this machine, pretty much anyone can. My best friend for this project was easily tonymacx86.com, which we have praised in the past for its clear breakdown of compatible parts and software guides. Let’s start by discussing the parts that I decided to use for this build. First off, for a processor, I chose the quad-core Intel Core i7-4770K chip, clocked at 3.5GHz. This processor runs $315 on Amazon and is one of the most highly supported and praised processors for a Hackintosh. Plus later on, I can overclock it if I choose to. Next up, I went with 16GB of Corsair Vengeance DDR3 RAM. You can always go with more, as the 4770K processor supports up to 32GB of memory. In terms of storage, I decided to go with both a solid state drive and regular spinning hard drive. The SSD will be used for the operating system and apps, for a quick boot and quick performance, and the spinning drive for media storage. I chose the 120GB SanDisk Extreme SSD. In retrospect, I wish I had gone with a tad more storage, but I can always update it at a later point. For the spinning drive, I chose the 2TB Seagate Barracuda. For a motherboard, I chose the Gigabyte GA-Z87X-UD5H Z87 LGA 1150 board. The big thing here is making sure that the LGA numbers matchup between your processor and motherboard. In this case, mine did. This motherboard has support for 10 USB ports, 8 of which are USB 3.0. There’s really not much to say about it, except for the fact that it has plenty of ports and a GUI-based BIOS, which can be seen as positive or negative, depending on your preference. It was a positive for me, being relatively clueless within the BIOS. For a graphics card, I went with the EVGA GeForce GTX760. This card received excellent reviews and is known to work very well with Hackintoshes. I thought about going for something with more power, but decided that I for my use cases, it wasn’t worth the money right now. One of the big things about building your own computer, however, is that you can upgrade individual parts at anytime, so I will definitely do that at some point. As I noted above, I intend for this machine to be capable of easily powering a 4k monitor, so obviously I needed something to test this with. In order to be somewhat budget-conscious, I chose the Seiki 39-inch 4k display. While not the best display on the market by any means, it’s definitely nothing to slouch at. But more on that later. Finally, one of the most important aspects for me personally, was finding a good case, and I definitely succeeded with that. I chose the Fractal Design Define R4 case in Black Pearl coloring. From the outside, the case is very sleek and clean, which is exactly what I wanted. Two of the biggest selling points of the case are its insulation and its claim to be totally silent. Once I got all of the parts, it was time to put them together, a process that was totally foreign to me. Needless to say, I was a bit intimidated at first, but once I got going, there was nothing too challenging at all. I’m not going to go into full detail on putting the machine together, but I will say this: The manuals that come with the components, as well as Google, are your best friend. Especially the manuals for the motherboard and case. When I first got the case, I was shocked at the size and weight, but this turned out to be a great thing. Once I slid off the side panel and begin planning the process, it became clear to me that more room is better than less. I started out by putting in the two storage drives first. This was incredibly simple and involved just attaching the drives to two of the many bays within the case. Then I laid the power supply in the case, using the case manual as a guide. Next, it was time to place the motherboard in the Design Define. This process was relatively straightforward. I first had to put 10 pegs in the bottom of the case. All of the holes were clearly marked and labeled. Then, I simply had to line the motherboard up with those screws, lay it over them, and then screw it into the pegs. Next came installing the RAM, which was incredibly straight forward, as all I had to do was pull back the ends and slide the RAM right into the board. After that I installed the Core i7 processor, which, while the most expensive piece of the build, was also the smallest. After I installed the processor, I placed the included processor fan over it, and tightened it to the motherboard. Then came the task of inserting the graphics card, which intimidated me at first, but actually just involved plugging it into the motherboard and making sure the ports were accessible from the outside of the case. This is arguably the easiest part of building a Hackintosh. Thanks to tools like UniBeast, making a bootable flash drive of OS X Mavericks is very, very easy, although you need to have another Mac to install it from. 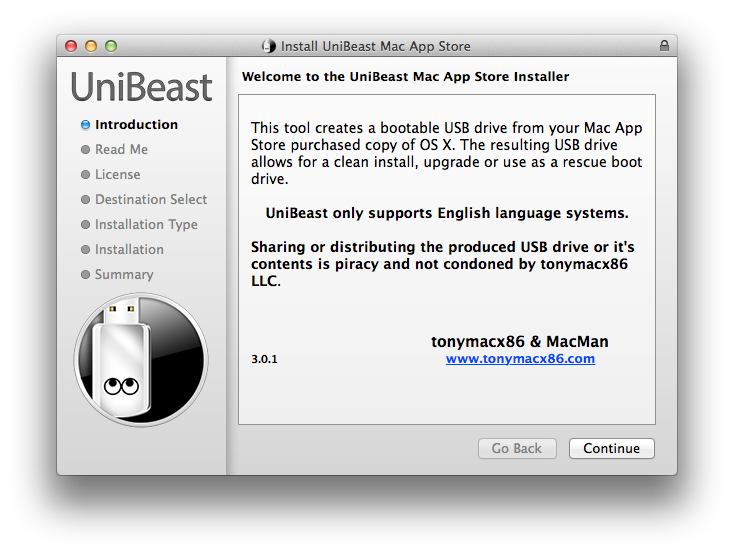 First, I downloaded UniBeast from TonyMacX86.com, as well as the free copy of Mavericks from the Mac App Store. Once both downloads were completed, I launched UniBeast and inserted a 16GB flash drive (though anything 8GB or larger will work). Purchase OS X from the Mac App Store. In order to boot from the USB drive, I had to change my BIOS settings to look for it first, but once you do that, the OS X install process is exactly like any other Mac. I formatted my SSD into two partitions for my install, one larger 70GB partition for OS X, and a smaller, 50GB partition for Windows 8. The install took roughly 25 minutes, and then it booted right into OS X Mavericks. Don’t get too excited, though, because there’s still a few last things to be done. I now downloaded MultiBeast from TonyMacx86 and opened it. 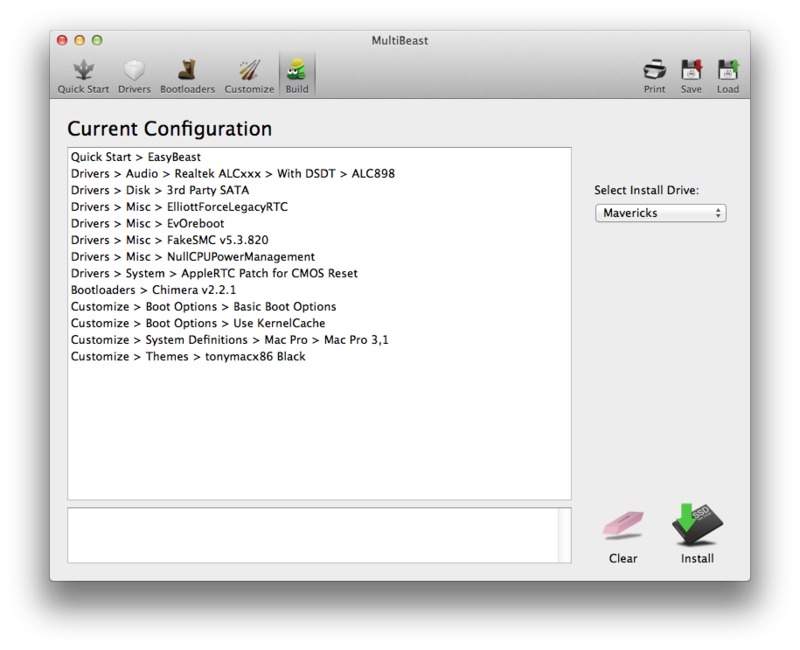 MultiBeast is the ultimate tool for making your Hackintosh bootable without a flash drive and helping you find the correct drivers. Luckily, the only drive I ended up needing was for audio. I simply chose the “EasyBeast” option from MultiBeast, as well as the drivers for my audio, which if you use the same motherboard as I do, is the Realtek 898. After the install process with MultiBeast was complete, I rebooted to find sound working perfectly and that I could boot without the USB drive plugged in. One major bug I ran into at first was not being able to download any apps from the Mac App Store. After researching for a while, I found a simple Terminal process to run in order to fix it. Another problem I had was my front USB 3.0 ports not working, but as it turned out, I had forgotten to connect those to the motherboard. Oops. I’ll keep this part updated with any more bugs I run into (hopefully not that many). But now, let’s talk 4k. Seth reviewed the Seiki 39-inch 4K TV in detail earlier this week, and for the most part, I agree with everything he had to say about it. My Hackintosh was able to easily power the display, as well as another 1080p monitor at the same time. I could have multiple 1080p videos playing at once, with no issues whatsoever. The display was essentially plug and play. All I had to do was change the resolution in System Preferences on the Mac. The mouse lag, which can be totally attributed to the 30Hz capability, is incredibly annoying at first, but once you get use to it, it’s totally okay. The GTX 760 graphics card I put in the Hackintosh was able to handle outputting a 4k resolution without any issues at all. I never experienced any lag related to graphics at all, and 4k videos played back perfectly without any hitches. Would I recommend the Seiki 39-inch TV as a monitor? No. The 30Hz drawback is just too big for many people, myself included. The big thing for me, however, is the potential. Using OS X at a 4k resolution was absolutely amazing. The amount of content I could fit on one screen is a game changer, and needless to say, everything looked incredibly crisp and sharp. 4k is going to be huge in the future. Or if you get the right monitor and have a computer capable of powering it, it can be huge now. I’m definitely going to be on the lookout for another 4k monitor for daily use. And the fact that my Hackintosh is totally capable of handling it is great. So, was this Hackintosh a success? Yes. Without a doubt. I could not have asked for this project to have gone any better. As someone who’s never built a computer before, let alone a Hackintosh, I was pretty intimidated by the task at first. But once I did my research, I was totally comfortable the entire time. This is a beast of a machine and it’s definitely going to be my daily driver for a long time to come. I absolutely love the case I got. It’s absolutely silent and looks incredibly slick from the outside and was really easy to work with on the inside. Best of all, I still have plenty of room to expand make this Hackintosh even more of a beast down the road. One of the biggest things I got out of this was the potential of 4k. It’s going to be huge, maybe not immediately for consuming content, but for a monitor, you cannot beat it. The amount of information you can fit in one area is amazing and going back to anything with a lower resolution will be a major challenge, which is why I’ll be keeping an eye on 9to5Toys for some sweet 4k monitor deals. Apple’s Mac lineup consists of MacBook, MacBook Air, MacBook Pro, iMac, Mac Pro, and Mac Mini. The Mac runs macOS for its operating system. A collection of tutorials from the 9to5Mac team helping you fix and get the most out of your Mac and iOS devices. Chance is an editor for the entire 9to5 network and covers the latest Apple news for 9to5Mac.